Packing up this beautiful Basico with rotisserie for it’s trip down to Virginia! It probably won’t fit under the tree, but it will definitely make someone happy this Christmas! Up, down, whatever it takes! Up, down, whatever it takes to get you that perfectly cooked steak. 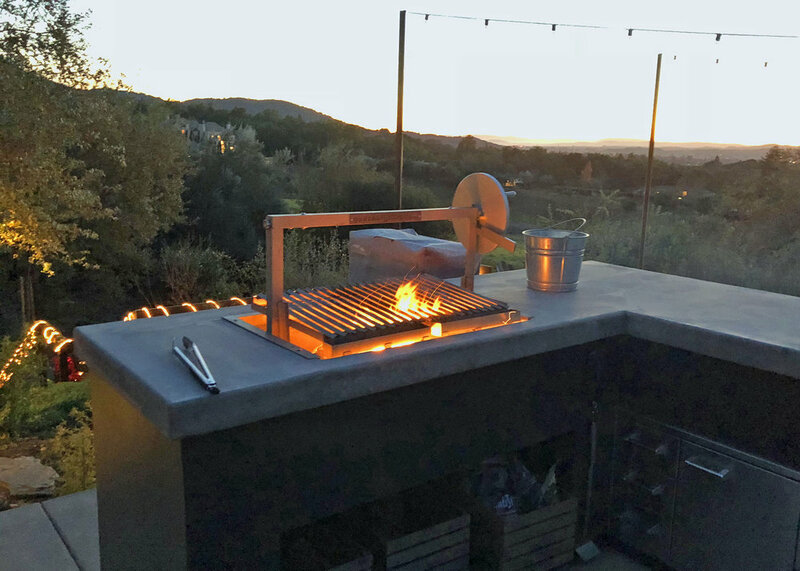 With a Gaucho Grill we have great temperature control, awesome woodfired heat retention with the firebrick and a whole lot of grilling fun. You can kind of hear the sizzle of the steak over the sound of the pool being drained. We love the Fall. Yes the pool shuts down but the cool Autumn vibes start and of course we keep on grilling. 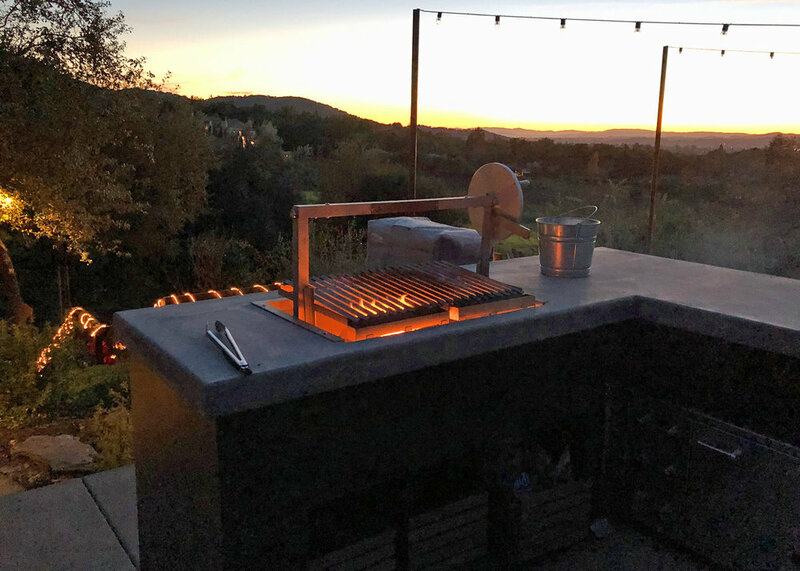 This gorgeous Gaucho Grande Insert was installed in Bronxville, New York by the talented team of Richard Gonzalez Architect, PLLC, and JCI Construction Corp. What an incredible view! A quick dinner from our founder, Eduardo, on the original Gaucho Grande Insert. Steak, corn, ribs, sausage, with lump charcoal and apple wood doing the work. It's summertime, it's hot, join our founder Ed to grill up some huge, juicy Ribeyes! 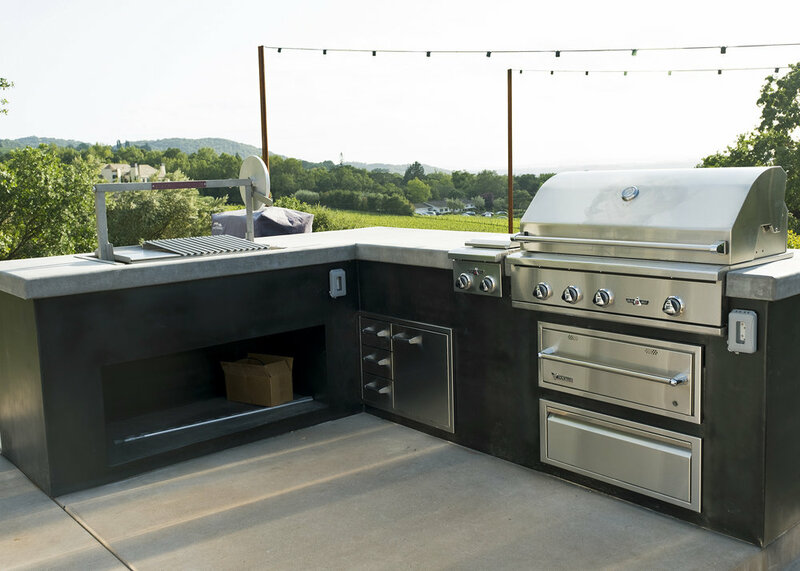 Every grill installation is unique, and we love seeing all the interesting, awesome solutions our customers come up with. This Gaucho insert from Napa, CA might be one of our favorite. It doesn't have a brasero, but because of the installation, it doesn't need one! Want your awesome, unique grill featured on our blog? Send in your photos today! 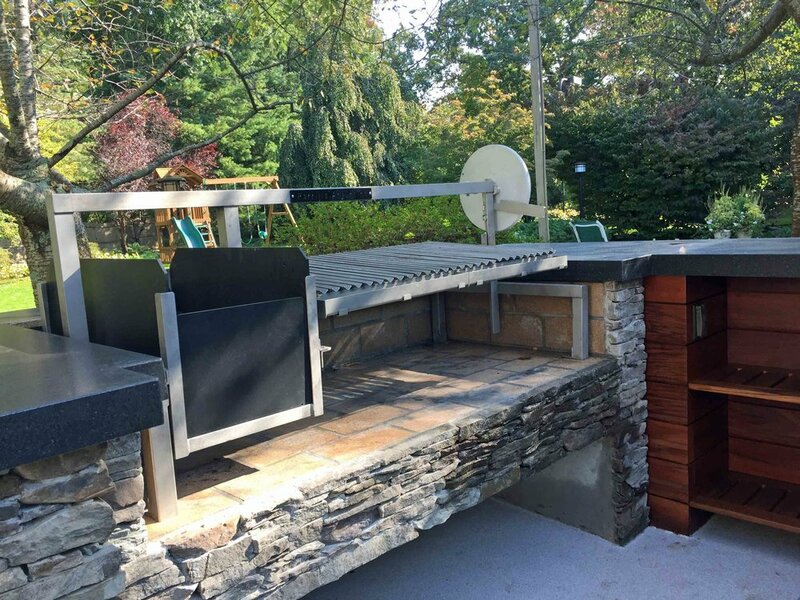 This great Gaucho Grande install out of Long island, NY takes center stage in a unique horse-shoe outdoor kitchen layout - We love it! This Gaucho insert with Brasero comes all the way from Texas - Check out all that meat! A Better Way to Start Your Grill with Wood or Charcoal! 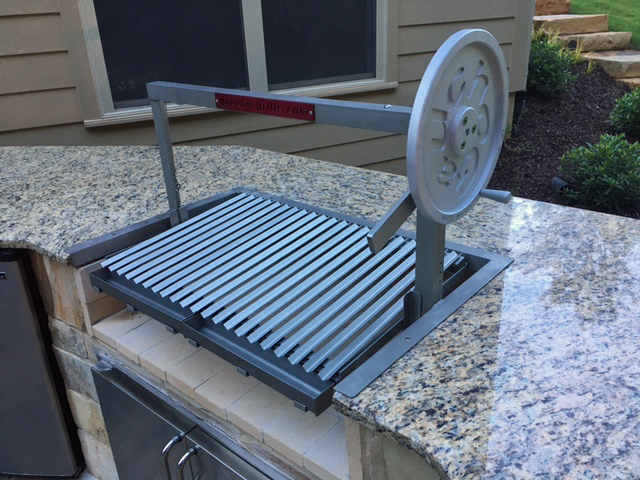 Learn how to use our new Brasero, with it's unique patent pending slat system, so you can grill naturally with wood or charcoal. This week we have another awesome installation from Georgia - a Gaucho Grande insert with a left hand crank wheel. Are you a lefty? Just choose the option at check out, as simple as that! 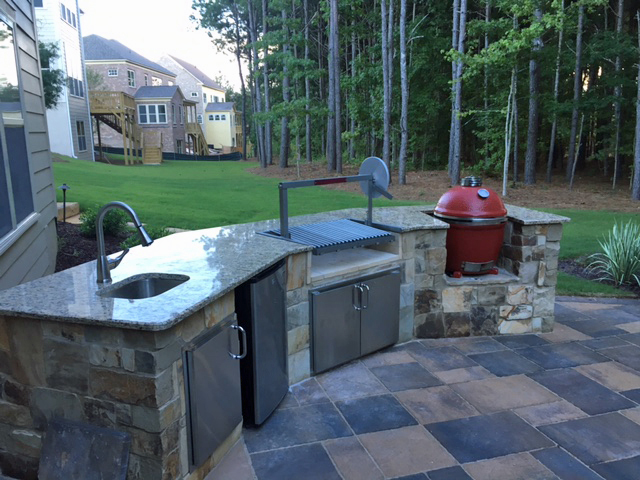 We love this unique install out of Georgia - A Gaucho Insert flange mounted into a countertop! small bowl and stir in the chives, lemon zest, and garlic. Set aside. spears with canola oil, salt, and pepper. 3. Prepare the grill for medium high cooking. Spread the potato slices and broccoli over the grill in a single layer. Grill until grill marks form and the broccoli chars lightly, about 8 minutes. 4. Using kitchen shears, cut along the center of the back of the lobster tails from the opening to the tail fin. Turn the tail over and repeat the same cut on the bottom; use a knife to cut through the meat to create two halves. Clean out the intestinal tract, if present. 5. Place the tails, shell side up, on the grill. Grill until the meat of the tails is lightly marked, about 3 minutes. Flip and brush with a little of the brown butter and grill until the lobster meat is firm, moist, and opaque, 2 to 3 minutes more. Remove from the grill and serve with the potatoes and broccoli and the brown butter. 2. Prepare grill for medium high cooking. 4. Transfer the wings to a large bowl and toss in your sauce of choice and serve. garlic and onions are soft, about 10 minutes. In a bowl, whisk together all the ingredients until emulsified. juice, ⅓ of garlic paste, cumin, oregano, a pinch of salt, and a few grinds of pepper and shake until combined. 2. In a large bowl, toss together the cooked quinoa, beans, bell pepper, and dressing. Let the salad sit to meld the flavors while you prepare the corn, scallions, and shrimp. 3. Prepare the grill for medium high heat. 4. Coat the corn and scallions with 1 tablespoon canola oil and grill, turning occasionally, until charred all over, about 8 minutes for the corn, 3 minutes for the scallions. Let sit until cool enough to handle. Cut the corn off the cob and chop the scallions. Toss with the salad. 5. In a large bowl, stir together 2 tablespoons canola oil, the remaining garlic paste, the lime zest, cilantro, and a big pinch of salt and pepper. Add the shrimp to coat. Skewer the shrimp with 2 skewers, one in the front and one in the back to keep the shrimp from curling. Grill, flipping once, until bright pink and opaque, about 8 minutes. 6. Remove the shrimp from the grill and immediately squeeze lime juice all over them. Divide the quinoa salad and shrimp between 2 plates and serve. Check out this gorgeous (and unique!) grill installation in Texas. 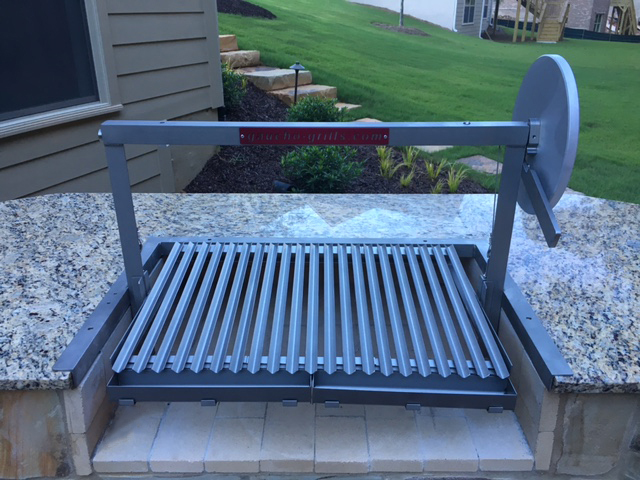 The owners had an existing fireplace, so rather than demolish and rebuild, we helped them out with a custom sized grill insert, with a brasero to match! Want to be featured? Send in pictures of your grill today! Join Chef Julie Hernandez-Roberts as she prepares the sides for our delicious Thanksgiving Feast. 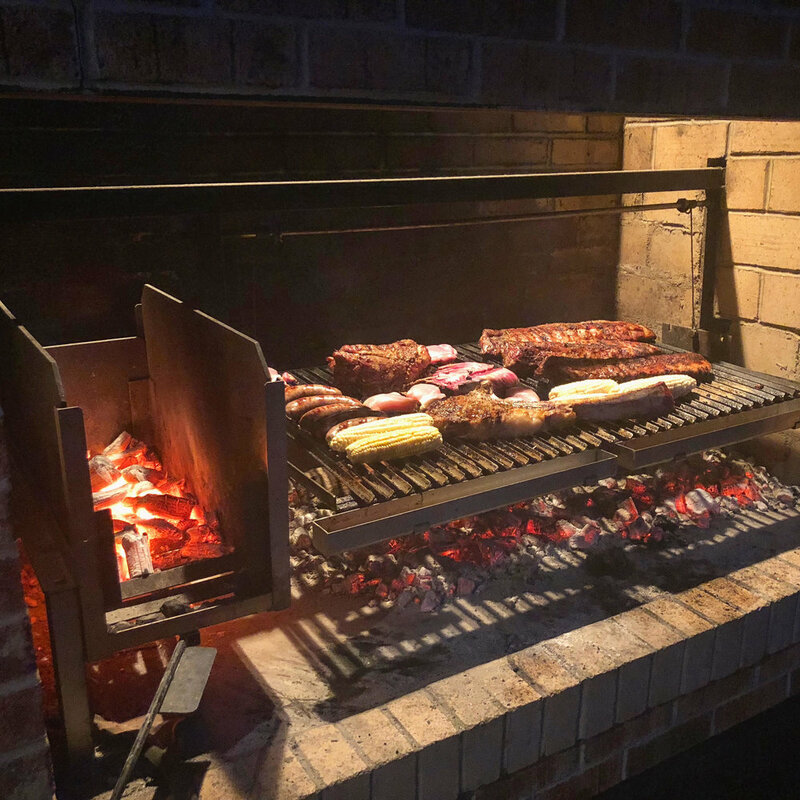 When we talk about Argentine cooking on this blog, we often make the point that there isn’t a lot of seasoning in play in many of the recipes we share. Often, the only spice at work in these dishes is the most basic and essential one there is: salt. Today, we’re going to look at a new element of Argentine cooking called salmuera. Salmuera simply means “brine,” or a highly-concentrated solution of salt in water. Unlike regular salt, this brine won’t toughen your meats.